Are you, your friends or family not big meat eaters? No worries, there's something for everyone at Burger Mondays. Below are 5 meatless items that you’ll want to try next time you stop in. This “secret menu” item, which can only be found on our mobile app is one meatless item that should be at the top of your bucket list. Chef Matt takes a house-made chickpea and herb fritter and tops it with lettuce, tomato, cucumber, yogurt sauce and hot sauce. It’s a taste of the Middle East right here in Binghamton! Salads can be good. Actually, salads can be great, especially when we’re taking about the Burger Mondays Caesar Salad. The romaine lettuce is perfectly tossed with shaved Asiago cheese, toasted croutons and house-made creamy Caesar dressing. We personally like to kick this salad up a notch by adding an Ahi tuna burger to the top of it. Pure salad perfection. Simple and delicious are two words that describe this burger. The sushi-grade Ahi Tuna is cooked rare and topped with Asian-style cabbage slaw and finished with wasabi aioli. This burger is light and savory with a slight kick from the wasabi. This is probably our most popular meatless dish, and rightfully so. The flavor profile of the Animal Lover is off-the-charts. 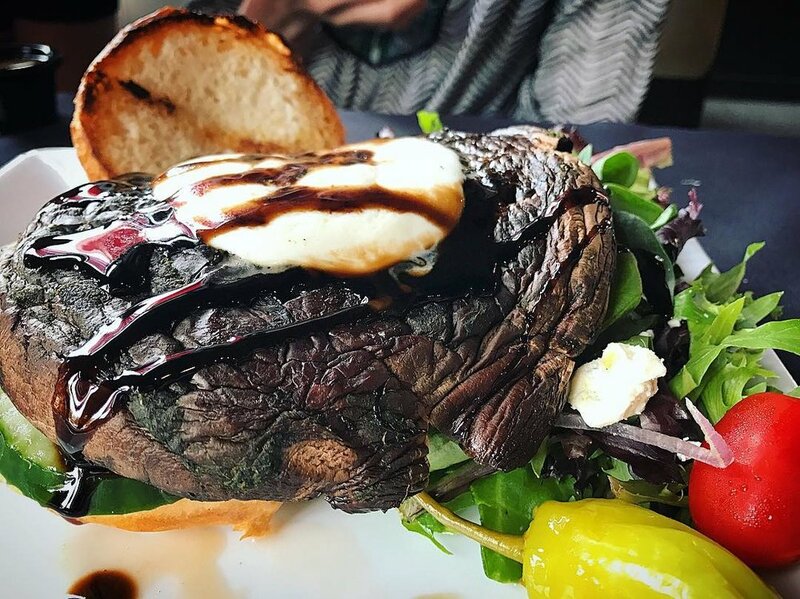 The pesto-marinated portabella mushroom is artfully topped with roasted red peppers, cucumber, tomato, house-made mozzarella cheese (yes, Chef Matt makes his own mozzarella cheese), balsamic reduction and house aioli. This burger is savory, sweet and delicious. Highly recommended for anyone abstaining from meat. We’re not kidding when we tell you this is the best fish fry you’ll ever have. Every Friday during Lent, Chef Matt dishes out orders of his famous fish and chips. The wild caught cod is Guinness battered, perfectly fried, topped with house-made tartar sauce and drizzled with a champagne vinaigrette. This dish is fried perfection. You’ll have to act fast though because there’s only two Friday’s left during Lent! See you soon at Burger Mondays!